Mario Artist: Paint Studio is a Japan-only game released on December 11, 1999 for the failed Nintendo 64DD, as part of the Mario Artist series. It was one of the only games released for the system and was never popularized as a result. 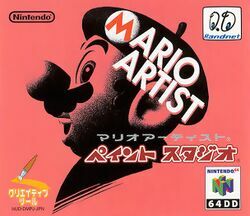 Mario Artist: Paint Studio worked like the earlier title, Mario Paint, in that players used different paint tools to draw images. Frequently bundled with the Paint Studio was the Nintendo 64 Mouse controller, which made painting on the game similar to painting on a computer. The player can play a slideshow of their images with music. Pictures of famous Nintendo characters could be used and manipulated on screen, and additional images could be imported from an RCA source using the capture cartridge or a Game Boy Camera. It also came with a unique four player drawing mode where four players could collaborate to make one drawing together. It is possible to create short animations with this game, 35 frames long. There are also minigames, including Fly Swatting (ovbiously based on the Mario Paint favorite Gnat Attack). The player can explore three 3D worlds- Mars, Underwater and Dinosaur Land (not to be confused with Dinosaur World) The player can travel through these environments and take pictures of the creatures who inhabit it. This feature is said to be similar to Pokémon Snap. Pre-release Mario Artist: Paint Studio; drawing a picture of Pikachu. Options how to use the Transfer Pak. Reading data off of the Game Boy Camera. Selected one image to import and changing the pallets. Imported and drawing on the image. Using the Game Boy Camera's camera without loading the cartridge. Note the camera is broken and shouldn't display like this. Mario Artist: Paint Studio is the only Nintendo 64DD game to use the Transfer Pak; by using the Game Boy Camera. This page was last edited on March 10, 2018, at 02:29.